This is part 3 of my yacht racing articles. Read part 1 with Tim Kroeger here and Martin Menzner in part 2 here. Now, that was an awesome experience! I´ve just coming back home after a full week of sailing in Croatia. But not just “for fun”: As part of the sponsors, my company, Enjoy Yachting was representing Beneteau Yachts at the “Rose of Charity” regatta this year. Besides me working there as one of the organizers I was commandeering a boat to attend the race as a contender. 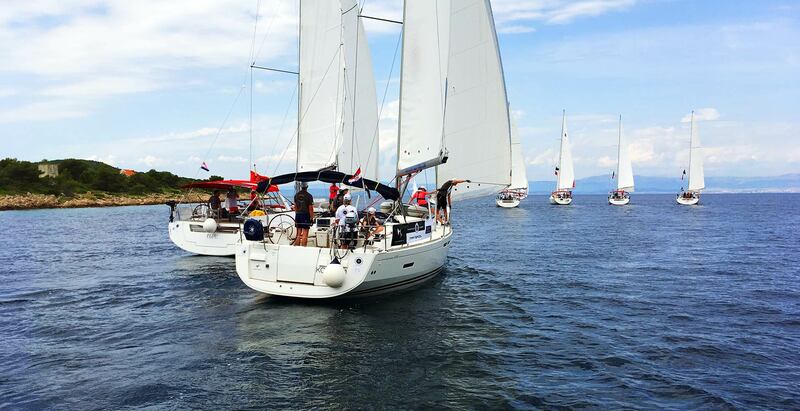 Six days of racing officially governed by the Croatian Sailing Association – a 48 feet boat with a crew of five people. And I´m in charge. Here´s my first ever true racing experience and what I´ve learned from it. Of course we all had ambitions to race the boat as good as we could. We sat together down in the saloon and after getting known to each other, my four actors had been receiving a proper safety briefing and we agreed on the general terms of living an racing together as a team during the coming week. I was happy to learn that all four were also keen on serious racing and my fears of being a skipper for a bunch of people just wanting to be sailed from one party spot to another was gone. Unfortunately the marina in Trogir wasn´t protected from the seas by a solid breakwater – swell had no problem in entering the mooring boats and a fast passing freighter was causing serious motion in the marina one day before casting off. The ship damaged four yachts – CHEEKY LADY as well – so badly, that one boat had to be cancelled due to a destroyed rigg and three boats had to receive new spreaders. Right after getting up all skippers were called to the meeting point where our race official, Dennis, was holding the official daily briefing. He was introducing the starting procedure, which consisted of flag signals and VHF announcements and safety regulations, which basically consisted of admonishments to adhere to international collision prevention rules and a plead for safe sailing. Each boat received a copy of today´s leg which was essentially a 15 mile course around two or three marks. A weather forecast update on wind conditions marked the end of the briefing. Back on board of my boat – still waiting for the technical staff to repair the boat´s spreader – I transferred the route to the paper charts and tried to get some additional weather forecast informations from the internet. There wasn´t really room for setting up a proprietary sailing strategy because of the narrow nature of our sailing instructions and the need to round the marks in a given order and on a given side of the boat. So there wasn´t really anything to plan strategy-wise. Anyway, I called up a crew meeting and briefed the my mates on the route, the major course changes and the marks we are to round. In the meantime the staff arrived, took off the damaged spreaders and worked hard to get the boat ready to rumble. So did we: “Clear up upper and lower deck for racing mode!”, was my order and we stowed away everything that could move or fall. All lines were prepared, the dinghy properly secured and tension rose. We arrived at the starting area with all sails up right at “5 minutes to start”-signal. The field of 15 other boats was running either under full canvas (the rookies) or remaining on position with barely making a knot under main solely (the pro racers). They all were more or less on the same position at the leeward mark of the starting line which was the better side to start from as the first mark was to be rounded to port, bearing away from the wind. I didn´t intend to run into this field and decided to remain at the windward edge of the starting line near the race committee boat for obvious reasons: We didn´t knew a bit about our boat and I desperately wanted to avoid steering us into the bunch of nervous 15 boats at the first day. We´ve had some trouble in understanding the VHF-announcements but every minute a siren was giving a tone and “X minutes to start” was announced on radio. We tacked up and down right at the starting line – some last minute practice for the crew – and I planned to luff during last minute to start and run at full boat speed over the line. This is how I learned it from racing professionals Tim Kroeger and Martin Menzer who I have interviewed on racing tactics and starting tactics in preparation for this event. “Real start!” was announced and I put the boat on port bow hard at the wind, we sheeted the sails as tight as we could and off we went. We could see the field do the same some quarter of a mile to leeward side and I was happy not being bothered by a fleet of boats racing nearby myself in under half boat length. Keeping out of trouble was the motto of the day and besides reaching this first goal we´ve made a wonderful start! I was proud of my crew and the tactics of avoiding the main field and CHEEKY LADY was making good progress in the first minutes of the race. Then the field exploded: The 51 feet flagships of the fleet just went off like nothing and sprinted away. No chance of following. Our 48 was doing … well, not so fine. The main (in-mast furling with no battens) was barely trimable and I could see the other boats making significantly more speed than we did. We tried hard to work on the sheet leads to squeeze out every tenth of a knot but there was no chance: Like a whale was sleeping on our keel bomb we just dragged an anchor and couldn´t match the speed of the fleet. The good start was made even and we found ourselves at the last position of the field soon. Nevertheless, the crew was motivated and never gave up. Changing helmsman every now and then we kept on steering the best course and continuously tried to trim the sails to convert every blow of the wind into forward motion. We knew that the result of worst day would be discarded and so the stress level and tension aboard CHEEKY LADY never really dropped. I utilized the time (we were racing some 3 hours due to a progressing calming of wind conditions) to work on my crew. Aboard with me were four German TV and movie actors who already had some sailing experience but of course were no professionals. I tried to get to know each of them and find out what level of experience they´d have. Lucky for me, the crew was highly motivated and was asking many questions without me having to push them. That´s an advantage to have people who want to know. In theory racing a yacht is quite easy. There aren´t too many rules. Being privileged vessel or obliged to give way is a set of two rules which are learned quite fast. The rest is tactics and thinking in advance: My position now – in relation to the wind – in relation to the next mark – in relation to the wind. It´s a step-by-step calculation and thinking ahead. Just like chess. I was blessed with having a crew of four clever people who were brilliantly applying their capabilities quickly to the necessities of sailboat racing and we quickly found decisions when to tack or to gybe quickly and mostly of one voice. The theory of sailing yacht racing is easy too: It´s like Tim Kroeger was summing up. The boat needs to be driven at her full speed capabilities at all time on every point of sail in every condition. This is made sure by knowing her potential peak speed, called target speed and calculating the gap of her current boat speed. The difference is the margin that has to be made good by steering her precisely and trimming her sails. Unfortunately CHEEKY LADY was equipped with a cruising mode in-mast furling main and both of her sails had their best days seen long gone. So I was putting away the polar diagram because there was no point in acquiring target speed from a polar that belonged to a sail wardrobe my boat wasn´t rigged to wear. Nevertheless I encouraged my crew to steer precisely and constantly worked with the main sheeter to have the sails trimmed properly – as best as we could. But the boat was losing speed all over the time and I reached the end of my knowledge. I just couldn´t get her running and blamed it on the poor condition of the sails. It all got worse the more the wind dropped. In light wind conditions the boat´s lack of speed compared to the others was more apparent. And the wind dropped so fast! We finished last on the first racing day. Nevertheless, during the after race de-briefing, I was praising my crew. Why? Because we managed to be a crew for good without having known each other before or having sailed a single mile together. We also kept up a good mood aboard and never lost our focus in getting the boat running. Third: We´ve made a good start and that was a good harbinger for the racing days to come. On skipper briefing for the second leg Dennis announced very, very light wind conditions and since the fleet had to reach the new port in a given time window he decided to go for a downwind start. Oh my! There were barely 5 knots of true wind when we reached the starting area and I again observed some pretty close encounters among the fleet of the other boats. This was dangerous because the wide sheeted sails and booms were narrowing the safe space between the boats. As the boats were making not more than 2 or three knots at all, manoeuvrabilty was very poor and reaction to helm slow. Let´s again keep away from the trouble, I thought, and had the boat steered to where not many of other contenders were waiting for the starting signal. We drifted more than we sailed. When finally the real start was announced, three boats got into serious trouble and we could witness big screaming and hassle going on with crew members running around on deck with fenders to avoid collision damage. We drifted away and again did a pretty nice start. Wind was very, very poor and a guessing game started: Where would be more wind? One half of the boats tried to steer away from the island we´ve had to round in anticipation of more wind off the shores. I opted to remain close to the island as I speculated that wind coming over the island may be “falling” down the flanks of the hills creating some local wind fields we would then harvest. But neither of both strategies seemed to be favouring a group. As booming out the jib wasn´t forbidden we sent a man to the shrouds to have the fore sail put into the wind – as butterflies we tried to run before the breeze. A fleet of some five boats were within talking range. I tried to steer my boat free of the shadow zones of other boats by creating shadow zones for others at the same time. Slowly and eventually we rounded the island and hoped that there would be more wind … and there was! The very last mark, rounding the island, was done, we could luff and suddenly there was more wind. Each boat then sprung to life and even our lame duck was picking up speed. We jumped to the sheets and trimmed the sails for a reaching course. We´ve had a nice slow-speed battle going on for the past hours with a 44 feet and a 45 feet boat in our vicinity so the aim was to finish in front of both. The 45 footer turned out to be too fast and it just accelerated and sprinted away, but there was a second boat. The sheeted much more and went higher to the wind – staying higher. But they also widened their distance to the island. I decided to stay closer to the island as I saw that there was more wind being funnelled at the island´s hill flanks. We were faster and although CHEEKY LADY was poorly trimmable we crossed finishing line with more than three boat lengths. Great fun and high spirits in our crew! Again during the evening we were debating over what would make the boat slowing down. We still had no clue but we also saw that in this regatta smart decisions, good helming and a portion of luck may be favouring us. The second leg was finished again on a poor of the last places but at least we haven´t finished last and were still beating other boats. Let´s have the yacht set up even more better for racing, we decided and on the next day we were the first boat to leave the jetty to go out and practice. When does my boat perform best? Whilst the others were still enjoying their breakfast, we were tacking up and down and trimming the sails for every point of sail on both bows. With an Edding we made marks on the sheets controlling the main sail and the sheet leads for the jib to be able to have the sails adjusted to new points of sails even faster without the need for finding the best sheet trim. That was a smart decision and this was boosting manoeuvre-time significantly. Days later, when on the last race day the wind was up to 15-20 knots true again, I would say we were one of the fastest tacking crews – due to our marks on the sheets! We also tried a new sailing tactic in the third day: Being aware of the fact that our boat somehow (we would later know why) was the slowest of the fleet, we had to do at least something to keep her sailing at the highest speed possible. Sailing within the Croatian waters means to have one of the over 800 islands of the Adriatic sea nearby at all times: Wind shifts are common here. We decided to apply a new tactic to not steer the best course but the steer each and every wind shift, no matter what this would mean to the general and probably best course. We applied this new tactic on the third day and guess what: We were able to secure a 13th or 12th place and again let some boats behind! We were slowly but surely improving. Day by day both the performance of our crew as a team as well as the performance of the boat were making progress. Kai, our new part-time crew member, brought the deciding turn to our favour: When we casted off for the fourth day he encouraged me to not put the lever of our Diesel engine in reverse gear – the way one does normally does it – but to leave it in neutral. “Who knows? Maybe it´s a fixed blade prop?”, he guessed. As we didn´t had anything to loose I agreed. We felt the prop turning and there was a constant tone, a humming, that was changing frequency as the boat increased speed (with the propeller equally increasing speed). I don´t know until now if this was the reason but I must admit starting from this point the boat began to sail quite good indeed! Don´t loose patience. And focus! The fourth day was a thriller of it´s own! We again made a fantastic start but couldn´t quite hold the speed of the ultra-modern +50 footer yacht. We were holding a quite nice position with some 5 boats behind us. Again fighting the 44 footer, we decided poorly and tacked too late some 3 tacks into the finishing line. The other boat was overtaking and was able to increase its advance to four or five boat lengths. No chance to catch her, one would say. But luck is a whore and I guess it was cockiness that was driving the other boat: The miscalculated the last tack and we could see it from behind that they wouldn´t make the finishing pin. The question was: Will the other skipper tack again to gain some height and then again into the finish? Or will he try to squeeze hard at wind´s edge to put the boat over the line on the old bow eventually? I pushed my crew and we gathered the last bits of motivation – we tacked later and were sure we´d make it over the line without a further tack. The other skipper panicked and decided wrong: No tack, tried to put her over the line. But the gambling was too high: The boat stood dead in the wind with sails killing. One single metre to the line right in front of the finishing pin! When we passed the boat and catched it, you cannot imagine our delight! Spirits were high on CHEEKY LADY during last night before the final leg of the regatta. We were very pleased with out performance: Not only did me managed to finally get the boat to sail, we also managed to build a formidable crew. I´ve had appointed a proper co-skipper whom I trusted the command blindfolded, two of our crew were obsessed in trimming the sails and constantly improved their manoeuvres so that tacking and sheeting in the job was a matter of a few seconds now and even the “black sheep” of our crew who during the first days kept himself from an active part in the crew now demanded the helm on his own initiative and turned out to be a very, very fine helmsman capable of holding the 48 feet boat flat on perfect wind edged course. I was excited: For the last day forecast promised a 15-18 knots wind and the course, as we git to know during skipper´s briefing was again a fine one with lot´s of upwind, some running and some reaching in it. I couldn´t find any sleep. Let´s have a great last leg of racing! Again, we pulled out of harbour first and in contrast to the rest of the fleet (of which I found some of the crews already being a bit tired) we sailed to the starting line which was a matter of some 30 minutes. The other went under engine. We started quite nicely but not perfect, I´ve miscalculated the wind (we haven´t sailed too much the boat in real wind so that I was holding too much distance to the starting line) and so we lost 5 to 8 positions. But anyway, it was good racing with lots of heeling, nice gusty winds and up to 8.5 knots SOG in the Beneteau Oceanis 48. The prop was turning in a high pitched sound, everything was going quite well. Three tacks to the first mark, then bearing away to a running course. Every other boat of the fleet was running flat before the wind, I decided to steer away from the shortest plot and go for a reaching point of sail: This would make us faster and bring us nearer under the coastline. I gambled and hoped for another funnelling effect at the flanks of the island and … I was right! We catched one more boat and could widen the distance to the chasing boats. Second and third mark on a reaching course, wind dropped in the lee of the large island and one chasing boat managed to come up to one boat length. I whistled as loud as I could and with the last sight of Poseidon CHEEKY LADY was pushed slowly around the last mark. “Now folks sheet in all sails and get to the rail, let´s go upwind and get everything out of the girl we can!”, I hollowed as we rounded the island. I took over the wheel and placed one on each winch. “We hold her as close as we can, upon my mark, you easy the sheets a bit in gusts, but get her tight as soon as the gust is over!” The boat was pushing hard and we barely dropped below 8 knots. Two or three times the boat was broaching and I had to hold tight to the wheel in hard rudder to prevent her from sliding into the wind. We rode her hard like nothing and the pursuant boat quickly lost ground to more than five boat lengths. We darted across the finishing line, hollering and screaming. Again, we managed to drive the boat with 5 yachts behind us. What a glorious day! When we were mooring safely back in our base again, all 16 yachts had arrived and the race was over. We were celebrating and discussing, full of excitement and stories to tell. I was so proud of our crew and what we have achieved in the past week. We formed a formidable crew out of nothing. We were able to motivate ourselves even when things started poorly and didn´t improved. We were holding up our spirits and managed to drive energy from the small things. We focused on what we could do, and did it, even if it seemed too small to make a change. We did manage to drive the boat from a lost last place to being a serious contender for other boats. CHEEKY LADY finally finished on position 12 of 16 after 6 legs (and a surplus cocktail mixing challenge). I am still so proud of our achievement! It was an honor to sailing with you guys! In the end I´ve learned so much and can again drive so many things from this awesome experience. 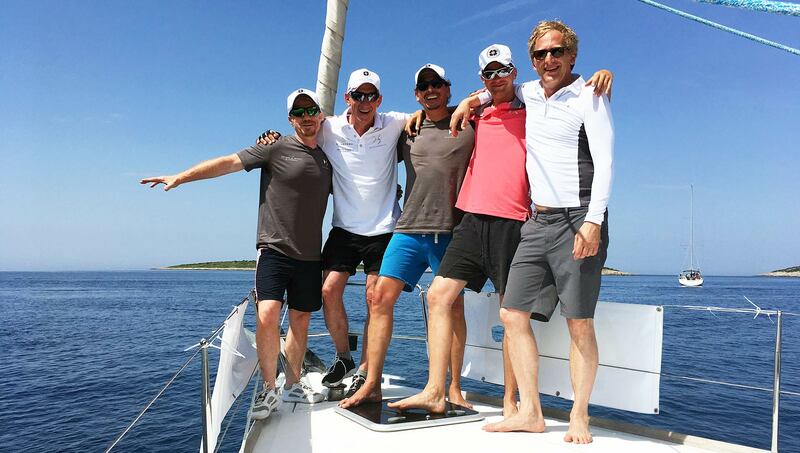 Forming a crew – even from strangers – as being the most important of all the things learned. Keeping up spirits and motivation high. Never give up trying, trying out things, go small steps, gamble, think different. All this is so important. All this – and not the big things – made us improving our performance and finally ploughing through the field. Still, CHEEKY LADY is not a serious racing machine nor a good performer. But I am thankful of having had this boat as my first racing command as it had taught me a wonderful and valuable lesion: It´s the people and the power of people´s minds that drives things. Everybody can win in a high tech modern performance-rigged boat. But turning the tide with inferior material and to win against despair and not giving up is a different lesson. A lesson I will hold dear. Thanks to the great crew of CHEEKY LADY: Kai, Heio, Frank and Kasem, best crew I could have wished for. With you, anytime again! And thanks to our guests Philine and Kai. Sharing this wonderful experience with you was a true pleasure! 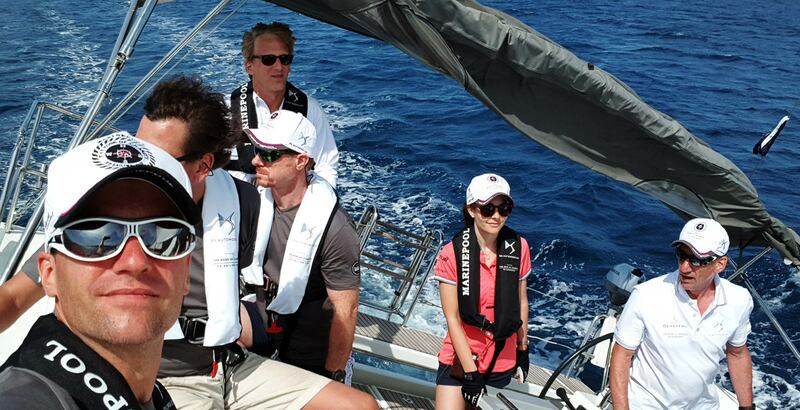 Thanks to Enjoy Yachting & BENETAU and Ultra Sailing in Croatia for this great experience! My first sailing trip as a skipper. Previous Post	Sustainable Yacht Building? It´s possible …!